MuQallideen Objection : They say According To Your saudi scholars Taqleed Is allowed for Aami Then Why don’t You (Ahle hadees) Agree?? If A Layman (Aami) asking The Maslah to Mufti it is called as Ittibah or Taqleed…?? This is only the difference of “Word” some Scholars call it itteba some Scholars call it Taqleed. 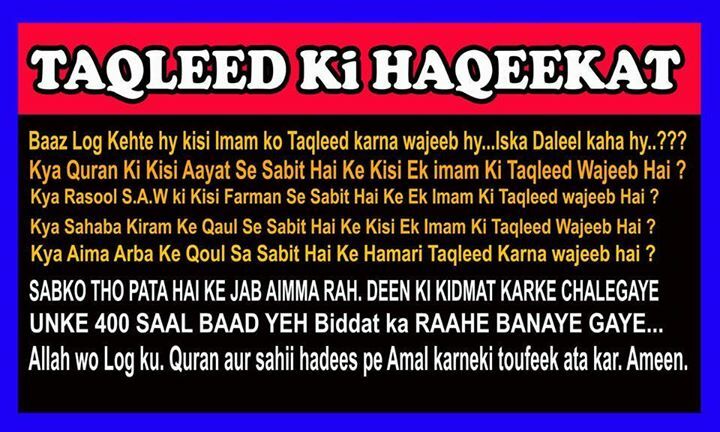 Taqleed-A-Sakshi : Kisi Saksh Ke Qaul ko Bagair Daleel Bagair Saboot ke qubool karlena Hai …… Taqleed. pata nahi wo log ke nazar me HADITH kya hai..
Zara Gaur Farmaye Is Quran ki Ayaton par.. If the person of Sunnah takes the truth with its proof from the Scholars and he – if he is from the laymen – is behind the Major Scholars and their fataawaa that are based upon the Book and the Sunnah – as is normally the case with them – and the understanding of the Salaf of this Ummah, then he is called muttabi‘ (follower) and he is not called muqallid (blind follower) with a blameworthy taqleed (blind following). This is the Manhaj of the Salaf and the ruling of the Scholars on the person of Sunnah. Please I would like to know if there is anything wrong with not subscribing to a math-hab. I learn from both the Salafees and Sunnees (ie. I try to adhere to the Qur’aan and the Sunnah) but I don’t like to claim either of the two because I fear that pride that might grow in me and cause me to avoid the truth if it comes from another source. In other words, I don’t want to be like some people who follow a math-hab and don’t want to change when the proof is against them. Please advise me. This question requires that we clarify some issues first. In the first part of the question, it seems the questioner is asking about blindly following math-habs. Then, the questioner refers to the following of a general manhaj, one that includes themath-habs of Fiqh and others, called the Salafee manhaj, or Sunnee (manhaj). Q) What is the true meaning of taqleed and what are its categories along with the clarification of its ruling? A) All praise is for Allah alone and may the Peace and Blesssings be on His messenger, and his family, and his companions.